Several millions of tons of plastic waste are floating across the oceans and are washed ashore. The minute particles of plastic debris are fatal for countless marine animals and sea birds also because they are partly mistaken for food. Plastic leaves a lot of traces in the environment which due to the lengthy process of degradation will stay there for hundreds of years to come. This is the downside of the exceedingly practical material that has revolutionized large areas of our daily lives due to its multifaceted characteristics and broad fields of application. Synthetic materials will continue to play an important role. Their innovation potential is considerable and promises progress – be it in the medical field, in communication technology or for automobile and vehicle construction. But in future, how can the ecological consequences be avoided that arise from production, use and disposal of plastic materials? Are there any alternatives to plastic or to the way society is dealing with it? The team of the junior research group PlastX is developing strategies on this subject with a focus on alternatives to plastic, avoiding plastic, and management. 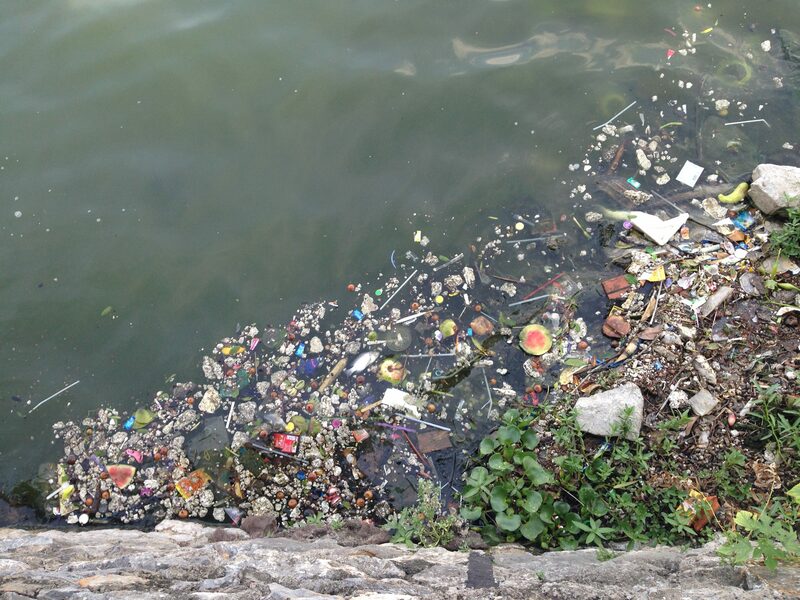 Interlaced, global risks are characteristic for the complex problems caused by plastic. “Societal actors from various constellations are part of this interlinkage”, says Johanna Kramm, one of the two project leaders. “These actors can be responsible for causing the risks or can be parties affected.” “Due to the inter -and transdisciplinary approach we are following in PlastX it is possible to view the issue from different perspectives and independently of single problem carriers”. Johanna Kramm, human geographer and Carolin Völker, ecotoxicologist are from ISOE – Institute for Social-Ecological Research and are together leading the junior research group. Other participants of the joint project are the department of aquatic ecotoxicology at the Goethe University Frankfurt and the Max-Planck Institute for Polymer Research in Mainz. As a junior research group, PlastX pursues the goal of training young scientists in inter- and transdisciplinary research. “Plastic causes social-ecological problems which offer themselves for solutions through the cooperation of various scientific disciplines”, says Carolin Völker. But this approach is difficult to implement in practice. “We deliberately accept this challenge and are for this purpose using ISOE’s methods and concepts for inter- and transdisciplinary work”, says Völker. In the next five years, postgraduate students of biology, chemistry, geography, and sociology will work together in the research group PlastX. Following the life cycle of plastic they will focus on the task fields packaging and consumption, risk assessment of microplastics in rivers and finally management strategies for plastic waste in oceans. ISOE is one of the leading independent institutes for sustainability research. For over 25 years now, the Institute has been developing fundamental scientific principles and future orientated concepts for governments/policy makers, the civil society and business leaders – on a regional, national and international scale. The research topics include water, energy, climate protection, mobility, urban spaces, biodiversity, and social-ecological systems. Goethe University is a research-oriented university in the European financial centre Frankfurt founded in 1914 with purely private funds by liberally-oriented Frankfurt citizens. It is dedicated to research and education under the motto “Science for Society” and to this day continues to function as a “citizens’ university”. Many of the early benefactors were Jewish. Over the past 100 years, Goethe University has done pioneering work in the social and sociological sciences, chemistry, quantum physics, brain research and labour law. It gained a unique level of autonomy on 1 January 2008 by returning to its historic roots as a privately funded university. Today, it is among the top ten in external funding and among the top three largest universities in Germany, with three clusters of excellence in medicine, life sciences and the humanities. The Max Planck Institute for Polymer Research (MPI-P) ranks among the worldwide leading research centers in the field of polymer research since its foundation in 1984. The focus on so-called soft materials and macromolecular materials has resulted in the worldwide unique position of the MPI-P and its research focus. Fundamental research on both production and characterization of polymers as well as the physical and chemical properties analysis of polymers are conducted here by scientific collaborators from all over the world. Presently over 500 people are working at the MPI-P, the vast majority of whom are engaged in scientific research.